Between 2D Video and Social media we have the ‘Back Channel of Social TV’ and of course almost joined at the top of the multi-platform map, Social Media slowly becomes more 3D from right to left and moves into Social Games & Virtual Worlds across ‘indicative’ services such as CyWorld or Second Life or World of Warcraft. Please note that the territories listed here are ‘representatives’ of a specific ‘family’ of like-platforms and of course the map is not exhaustive. There is a world (land/society) of difference between the main continents of 2D video media, 3D game, Physical Space (outdoor) and Social Media. Within each of those continents there are big cultural differences between each territory. In the Bay of Social Media a blog serves a completely different role to say, Facebook and over in 2D Video, uStream is an foreign country compared with cinema and in Lands of Physicality designing a game for an urban space is a million miles from writing a book or delivering to outdoor screens – you get the picture. One of the problems which started back in the days of mass media though, still pervades today. There is still a significant percentage of the ‘Digital’ industry that although they make noises about multi-platform integrated service design, still have a foot in 1970s thinking. They build their properties in each of the ‘territories’ where each build is the same as the last, and like invading hoardes they take what resources they can often by trying to be first come what may, ignore and in doing so kill off the indigenous culture in each territory and in some cases destroy all potential new media forms that were slowly evolving. Translation: A digital agency will produce a really badly designed service or reversion the non-appropriate stuff they already have on a new platform just to be one of the first kids on the block, but in doing so ruin it for those who may have followed with much more engaging new formats. Think what is happening to Video on the Web, Social Media Stories, Social Virtual Worlds, Locative Mobile and Augmented Reality for example as the advertising agency hoarde (amongst other invaders) crash on the shores and stick their flags in the virgin earth! 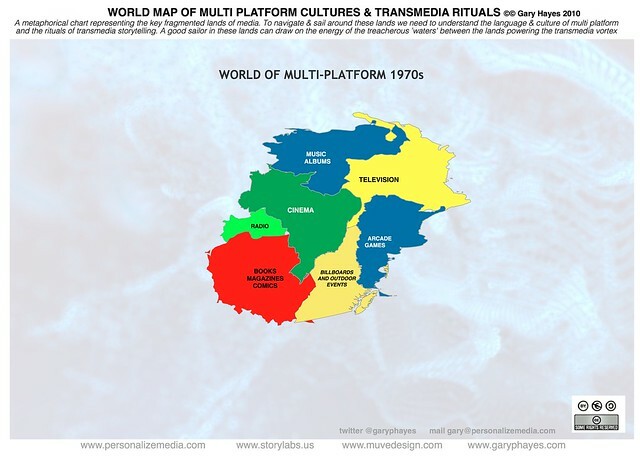 So to get to the meat of this article – what is my map trying to evoke and how may it help story tellers navigate the waters of multi-platform and transmedia storytelling? TRANSMEDIA TOURIST – Firstly like any ad-venture you must take time to do initial visits to each territory and see if there are opportunities for yourself. At first don’t be frightened to be a tourist but make sure you ‘personally’ visit all these media territories – ideally with a guide. Travel the transmedia world, subscribe to some social media sites, play a few games, have a look around, stalk, take pictures, ask questions of the experienced natives, try to speak their language a little. But be a respectful tourist and do not rely on 3rd parties or ‘photo’ books or video diaries to make decisions on whether or not it is worth setting up and taking some of your story there – don’t listen to territorial spin! MULTI-PLATFORM CULTURAL UNDERSTANDING – Be appropriate with whatever your offering in these new territories. After a few visits you will start to get a sense of what the cultural values are and how your ‘story/product/extension’ may be relevant to both the medium and your overall distributed narrative. Beware of being a bully-like invader, delivering out of context messages – you will be branded as an unwanted spammer. Expect not to get your VISA renewed in this case! THE ISLANDS IN-BETWEEN – Often the waters in-between the continents are where you can be most innovative. Take time to explore these rocky unstable, hybrid media outposts. Consider them as volcanic activity pushing up new lands full of potential but also unclear on how the landscape will eventually pan out. Many of the waters around are treacherous so you really do need an expert guide to make sure you explore all the islands – social tv, augmented reality, location based services and so on. BUILT FOR LONG JOURNEYS – Make sure your story ships are filled with enough people and resources for the long haul. Circumnavigating around the central transmedia vortex, visiting and populating many media lands requires skill but also a stalwart determination to discover and tell your stories in appropriate places. Don’t assume you have to try to make camp everywhere – there are many who fail dramatically by spreading themselves thinly and in-appropriately, like a bragging tourist who are more into talking about how many vs how deep they went into each culture Making your stories take root in those lands requires careful delegation by having the right people on the ground running your operation in those territories. The culture also does not take it well if you promise much at the beginning and do not keep those promises – you appear on the scene, talk about all the great things you have planned and then go for the low hanging fruit, and leave. Shame on you! BECOME A TRAVEL AGENT YOURSELF– Once embedded in a territory and you story or property is captivating also from ‘the local platform users’ cultural perspective you can be certain they themselves will want to travel and pick up your transmedia tour. For example, consider some of the Zynga peoples who want to follow your brilliant and deep story world, help them hire boats and move over to 2D video lands and sail across into networking events in Lands of Physicality. They will reward you for this but make sure they never forget their story roots. TALK AND LISTEN TO THE NATIVES – Constantly monitor how you are doing in each media territory. Report back to your master ship, is the outpost working as part of the whole story tour you have created. As a travel agent you also have to keep the locals happy, has your story seed taken root? Is it part of the local mythology, are the locals themselves spreading the word? Your goal should be to become part of their culture rather than a fly-by-night alien visitor and also to constantly evolve your extended properties. RITUALS AND ROUTES – As a creator of a story route through the multi-platform world you are a pioneer, not many have truly ventured and created good transmedia tours yet. A few have tried to create trade routes but once the locals got wind of that, carnage resulted (I hope some of these metaphors are not lost!). Your initial tours will start to become well trodden (sailed) and a story that started in the Valley of Blogs moved over to Serious Game Headlands, to the Fjords of Tablets, over to Flickr Reef, then to the Deserts of Second Life and so on, will be travelled by many. Have you allowed those that take your tour to leave their mark, recommend, add in their own stories, extend yours. Make the journey be as important, if not more so, as the ports your travelers will stop at. The transmedia rituals involve a trip that is a important as the destination and stories that organically evolve and spread to new territories fueled by the users enthusiasm. LEAVING HOME CONVERTING THE NATIVES – As the users themselves become hyper-experienced multi-platform travelers they will loose sight of what they call home. Once a dedicated natives of for example, only the Volcano’s of YouTube, they have had their eyes opened to the possibility of the small islands of Qik and uStream, realized that the Lagoons of Foursquare fulfill new needs and desires. At this point you are turning mono media users into transmedia travelers, multi-linguists who they themselves start to travel and tell their own travel stories, creating their own story tours across the increasingly busy waters surrounding the uncharted transmedia story vortex. Note: As this was mostly written in airports and cafes – I will tidy this article up over the next couple of days also! I gave a simplified version of the above combined with a quick overview of key multi-platform types and transmedia examples in New Zealand yesterday and I promised them I would ‘slideshare’ it. So here is it with embed below. A short talk that looks at recent evolution of multi platform and changing user behaviour. It will highlight the reason traditional storytellers, marketeers and service providers are, for their own survival, needing to develop new transmedia forms. What are some of the most compelling examples thus far, is there really a business here and where are we truly headed? Gary will take us on a short ride through a fragmented media landscape and some of the transmedia attempts to help glue it back together again. Stories are ‘made’ by the audience rather than the ‘storyteller’ or content curator or transporter. Digital spaces are defined by software design and heavily influenced by database developers. Interactions in digital spaces are negotiated based on measure and behaviour perspectives. It is also helpful to consider to dis-entangle stories, people and spaces or that people may not differentiate between different ‘story’ spaces or places as they go about their day. 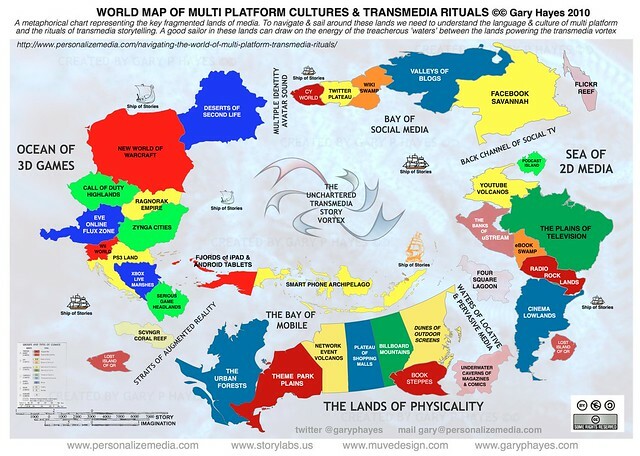 RT @garyphayes: Navigating the World of Multi-Platform & Transmedia Rituals t.co/64JVTAxd this may have saved my research! thanks!! !